Apologies for the lack of posts! Have been busy cleaning the new place that I will be moving to. Have been crashing at a kind friend’s place for far too long, so its time to move out! Hopefully once I moved into my new pad I might have more pics to post for my outfits as I am currently just living out of my suitcase. Heh. Anyway, here’s a bunch of pics that were of inspiration over the past week or so. Victoria Beckham and her dresses in classic silhouette can do no wrong! Of course, toting a Hermes Birkin is yet another classic staple in her wardrobe along with those sky high Louboutins. Emma Watson, the new face of Burberry and the one of the main cast of Harry Potter dresses like her age. It is so refreshing to see a starlet like her dressing up in her age as opposed to trying too hard to look all grown up. She is definitely classy unlike the other Hollywood starlets like Vanessa Hudgens, Hilary Duff, Lindsay Lohan or Miss Socialiate Paris Hilton, all of which I detest. I apologize if you happen to like either one of them. They are just too trashy in my opinion. Kate Lanphear, the Style Director for Elle magazine is a definite stand-out. She does not conform to the rest of the folks in the fashion industry by dressing up all girly and trendy. 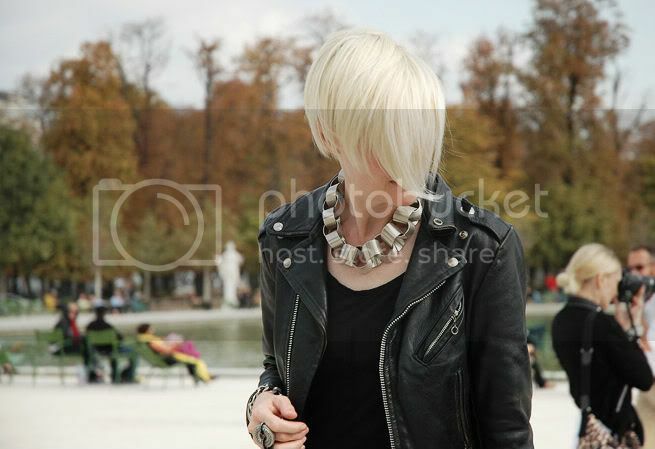 Her style is totally androgynous and rockin’ it all out in studs regardless of trend du jour. I am getting bored with my style and am toying with the idea of chopping my locks to sport a similar hairstyle like hers. I am broke and therefore have no $$$ to shop, hence the next best thing is to don a new hairstyle! I am thinking of waiting till I go home in December for my brother’s wedding to chop off my locks but we’ll see how long I can withstand the temptation. I usually tend to keep my hair longer in the colder months, by the way so this is totally an impulsive thing. Okay, enough with my ramblings. Till the next post! This entry was posted in Fashion and tagged Emma Watson, Kate Lanphear, Victoria Beckham on October 3, 2009 by fauxionista.